There's no place like Duluth to celebrate the Fourth of July. Take in an area small town parade and then come on over to Duluth to partake in the festivities going on at Duluth's Bayfront Park. Of course, Duluth's fireworks can't be beat. What more can I say... Happy Fourth! We had a late supper Saturday night at a fancy-dancy downtown Minneapolis restaurant following an evening of theater. I generally try to avoid fancy-dancy restaurants (by dancy I don’t mean there is dancing, which I really try to avoid, but rather because it rhymes with fancy, the way toity rhymes with hoity). As a meat and potatoes kind of guy, I generally don’t like the dishes offered at fancy-dancy restaurants, not to mention the food. If I pick up the menu and it includes a preponderance of words I do not understand, much less would be comfortable pronouncing to a waitperson, I become somewhat uncomfortable. I have learned over years and years of dining out that the more unpronounceable the menu item, the more it will cost you and the less you will get to not enjoy it on an oversize plate. That’s just the way it works in the world of fancy-dancy dining. So on Saturday night, reviewing the wine list (hmmm no Thunderbird) and the menu, I knew right away that we were in for a shellacking, as President Obama might describe it. Of course, at this writing, I could never recall or, especially, spell some of the offerings, save for one, which I ordered: spaghetti. Yup, spaghetti. And meatballs, it said. Not plain ol’ regular spaghetti, mind you, but some kind of spaghetti, to be sure. “I’ll take the spaghetti,” I told the waitwoman in no uncertain terms, proud to be able to pronounce SOMETHING on the menu. I think she knew what I was up to – pronunciation. In a very nice, helping, way, she said, “Did you know the meatballs are tuna? “And the spaghetti is black,” she informed. I did hesitate momentarily, but then went ahead with it. Black spaghetti and tuna meatballs. You have nothing to lose but your cynicism about menus that make no mention of things like “steak,” “baked potato” and other foods that my eye always seeks out when deciding what to order. To make a long story even longer, I was able to tolerate the black spaghetti and tuna balls for the first few bites, but it was one of those entrees that features rapidly diminishing returns. Half way through the second tuna ball, for example, I realized that I didn’t like it as well as the first. And far be it from me to ask for sides of pineapple and mayo. 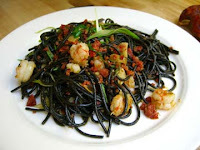 As far as black spaghetti (some would just say pasta noir these days) is concerned, it was tolerable. I finished much of my plate out of respect for the waitress (she’d warned me after all) and called it a late supper. So it was not a great dining experience, further marred because I thought I was sitting near a booth containing none other than Michele Bachmann. Somehow I was aware that Republican Rep. Bachmann, who is running for president of the United States, was in Minneapolis that day speaking to right-wing bloggers, so I figured it was possible it was she sitting there with her possible husband and, across their table, another possible man and woman, making up a foursome. All the while, as I waited for my black spaghetti and tuna balls to arrive, I couldn’t stop staring at this woman, becoming more and more convinced that it was Michele Bachmann. Still, her profile is so high now I couldn’t imagine that she is still able to just go into a fairly well populated restaurant and dine without people bothering her for autographs or attacking her verbally, depending on where they’re coming from politically. Even when this woman and her party stood up and left, I couldn’t be sure it wasn’t her. I still am not entirely sure, but I’m starting to doubt it. There is my report on how I spent my weekend. Black spaghetti with tuna meatballs and an encounter with Michele Bachmann or her twin or her clone. Well, not clone. Never clone. I’ve got to say the play we saw wasn’t so hot either. Plus, it rained quite a bit. 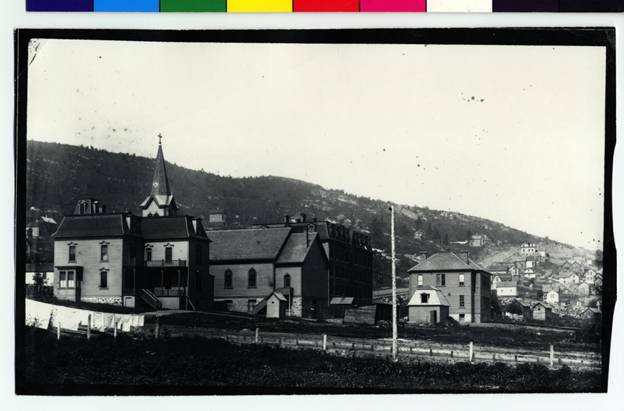 St. Clement's School and Church is pictured above. which later became St. Ann's Home for the Aged. Many of you readers with an interest in Duluth's history will enjoy viewing the 38 minute video, Early Days of West End/Lincoln Park. This Vimeo/video was researched, written and produced by Duluthian Wendy Grethen who received funding for her project through the Arts and Cultural Heritage Fund administered by the Minnesota Historical Society. Grethen is a community advocate and local filmmaker. The video includes interviews with seven locals having long-time personal and business connections to Duluth's West End (now known as Lincoln Park). 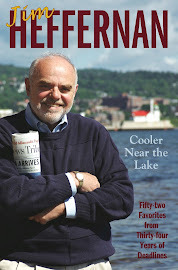 Their interviews–as well as old and new photos–are interspersed with a narrative history and music to learn about Duluth's West End beginnings. Those beginnings are told through the lens of area churches, schools, businesses, recreations services and through a progression of changes. Plans are being made to show the film at the Movies in the Park in Lincoln Park this August and you may also view the Vimeo video HERE on this link. James Arness is dead and I’m not feeling very good myself. Oh, I’m fine. Some wag wrote that after Elvis died, and somehow I always think about it when I read of a celebrity’s death. But James Arness did once cause me to feel very badly indeed. Of course we all know the Minnesota-born actor as “Gunsmoke’s” Matt Dillon on TV, a role he played for some 20 years, for a long time the longest-running show ever on television (1955-’75 or thereabouts). The actor died June 4 at age 88. He seemed indestructible in his prime. At 6 foot 7, he was a giant of a man whose image on the long-running western always displayed confidence and resolve. You couldn’t help but admire him. He was a stalwart Norwegian. But a few years before he found his niche in the old west’s Dodge City, he came from outer space, in the title role in the movie “The Thing,” which was fully titled “The Thing From Another World,” and they weren’t talking about Norway or Minnesota. It is as “The Thing” that I remember him best, even though his face was never shown and he didn’t speak. The movie came out in 1951 when I was about 11 years old – the age when you are getting ready to close out your childhood and start bracing for adolescence (heaven help you). 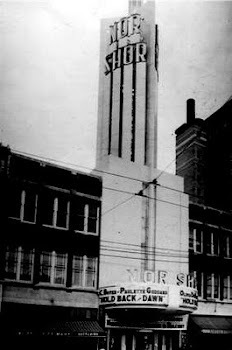 In those days I’d regularly go to Saturday movie matinees, preferably at Duluth’s old Lyceum Theater, where you could see double features for 9 cents if you were 12 or under. Other theaters charged 12 cents for that age group. Who had that kind of money? Because I was getting so “grown up,” I had reached the stage where I had no qualms about being home alone at night, no babysitters necessary, if other family members went out. No problem. I should point out that 1951 was smack dab in the middle of the post-World War II flying saucer era. Flying saucers were all over the news all the time, with fuzzy pictures in the newspapers of the discs flying in formation over various parts of the country, including Moose Lake. Crazy. So, thought Hollywood producers, why not make a motion picture about a flying saucer? How about one that crashes in the Arctic, is discovered by U.S. military personnel stationed in a nearby remote outpost, who also discover there a giant human-like creature (about 6 foot 7, encased in a block of ice) but is not human at all; it comes from the vegetable family and feeds on the blood of humans and sled dogs – any mammal it can get its crusty hands on, like a Venus Fly Trap eats bugs. Oh yes, one handy thing about “The Thing”: If you cut off one of its appendages – in one scene an arm is amputated by a slamming door – the appendage GROWS BACK! Yikes. That cured me of vegetables, especially beets. Meanwhile, back on the screen, the unlucky crew transports “The Thing” back to their base camp and inadvertently – yes, inadvertently -- melts down the ice block encasing him, releasing the monster to go about his business of plucking unsuspecting humans and other mammals from their appointed rounds and drinking their blood. Oh, the horror. A friend and I sat petrified in our seats at the Lyceum, although my friend ended up on his knees on the floor, his head on the seat, covered by his jacket. We lasted until “The Thing” took to hanging blood-drained sled dogs from meat hooks as he lurked about the wintery encampment, and a mad scientist (you knew he was crazy by his goatee) inside insists that the group should make friends with this monster from outer space, thank you very much. Whispering during a lull, my friend and I agreed we’d better get the heck out of there before the monster drained our blood (he already had, from our heads). Up the aisle we scampered, darting to the nearest exit sign and out into the bright Saturday afternoon sunshine of Superior Street, safe. Whew. But I wasn’t really safe. The fright caused developmental regression in me. No longer would I stay home alone at night. Any foray into darkness was accompanied by the concern that “The Thing” was lurking behind every tree. I was, in short, afraid of my own shadow for months. I didn’t see how the movie ended, having bolted for the street mid-way through. Many years later, as a consenting adult, I watched the entire movie on television, and finally saw how they killed poor James Arness (electrocution). By then I was no longer spooked by the movie. Real life is way scarier. To read more about Arness and the phenomenon of The Thing and view the original 1951 movie trailer, check out this Baltimore Sun link HERE. Here's the official Enger Park Restoration web site... neglected to include it in the previous post about Enger Tower renovation and lighting. Check it out HERE! And... you might want to also check out this MPR web site HERE where you can see a panoramic view from the tower and how to help with their Enger project. Enger Tower, Duluth's famous landmark, is lit again! (See the picture of the tower lit up and check out more information about the event HERE in Saturday's Duluth News Tribune story.) The famous hilltop beacon of Duluth has been undergoing a three month renovation that includes its sprucing up and some safety improvements. Friday night was the unveiling of the Rotary Club 25 of Duluth's project to light the tower with LED lights to once again shine on our hillside. 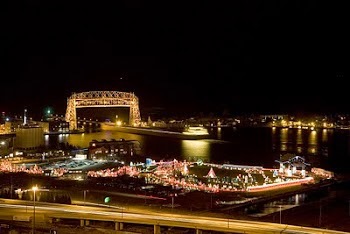 The lights went on at 10:10 pm on Friday night and we headed out to see it, also driving around town to witness that mighty Duluth beacon all lit up on our hilltop. Very exciting to see it lit once again! The renovations by the City of Duluth are in preparation for the October 17 visit by Norway's King Harald and Queen Sonja. 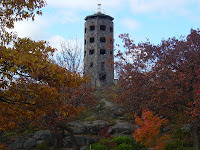 Some of you may remember my post (Happy Birthday Enger Tower–link to it HERE) in June of 2009 when I happened to climb the tower on the very day of the 70th anniversary (June 15, 1939) of its dedication by Norway's Crown Prince Olav V and Princess Martha.